In the last five months we’ve been traveling through Tuscany and outside our region for our book tour. 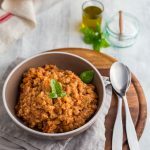 It has been a whirlwind of emotions, with a frequent question: which is the recipe that represents the quintessence of Tuscany, the one you should try at least once in your life to understand the true spirit of the Tuscan cuisine? A kaleidoscopic carousel of images spins in front of my eyes: arista, tortelli with potatoes, panzanella, ribollita… and invariably the wheel stops there, on the pappa al pomodoro, the Tuscan bread soup. So I ask to the people sitting in front of me: and how do you make your pappa al pomodoro? This question always ignites a lively debate, creates alliances and divisions, showing up the parochial and belligerent Tuscan attitude when it comes to food traditions. My family’s pappa al pomodoro, the one I learnt from my grandmother, has a clear Sienese mark: it is pale, with a few pieces of tomatoes scattered among a large quantity of mushy bread. Inside the Sienese city walls there are those who can’t imagine a pappa al pomodoro without clove, that gives a subtle spiced aroma to a recipe which is otherwise essential in its ingredient list. Then an unexpected ingredient was mentioned, too: an egg, beaten and stirred in at the very end, to give body and substance to a poor dish, a very similar addition to the egg whisked into the acquacotta. My first rebellion in the kitchen was to introduce the Florentine pappa al pomodoro, which I learnt from a friend, Emanuela. The Florentine version requires battuto, the foundation of Italian cooking, a mixture of finely chopped celery, carrot and onion and plenty of tomato purée, producing smoother and deep red result. Obviously the differences do not end here, as there are also those who would gladly replace the onion with a leek, for a more delicate soup. Cooking class after class, summer after summer, I came to my own version, which sits right in the middle in between Florence and Siena, just like me, just like the Val d’Elsa. My biggest success was when Grandma tasted it and affirmed that my pappa was her favourite one. I have reluctantly abandoned the tomato purée, which had freed the pappa al pomodoro from the summer constraint, in favour of ripe Florentine ribbed tomatoes, peeled and crushed with my hands. Obviously in winter, whenever I experience a physical need for my dose of pappa al pomodoro, I would do with a jar of good quality peeled tomatoes (or those we made during summer), and you can do the same when you can’t put your hands on good sun ripened tomatoes. In the debate whether broth or hot water is better to cook the pappa al pomodoro, I set up with the simplicity of a cup of lightly salted hot water: I’d rather taste the pure flavours of the ingredients – bread, tomato, extra virgin olive oil, garlic and basil – without the veil of broth taste. I refrain from any dogma, though: try both broth and water and choose the one that best suits your idea of comfort food. The other essential ingredients are stale unsalted bread and extra virgin olive oil, to be used without parsimony. If for you Tuscan bread is as an exotic ingredient just like lemon grass is for me, you can either make it it at home (here you find a recipe) or choose a bread with a crunchy crust, a delicate crumb and a very little amount of salt. So now, without further ado, here it is my recipe for pappa al pomodoro, the same you will find in my book, La Cucina dei Mercati in Toscana, published exactly five months ago. 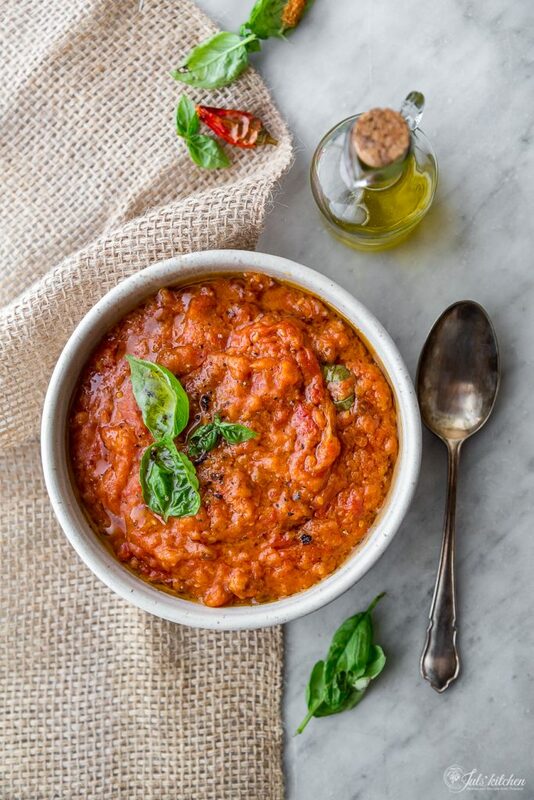 Have you already tasted or made the pappa al pomodoro? Maybe one of those I’ve already published? Should this pappa become one of your next weeknight meal, let me know your thoughts as I am so proud of this recipe, which perfectly represents who I am and my cooking style. First, peel the tomatoes: your pappa al pomodoro will be much more velvety and you won't find the tomato skins underneath your teeth. Plunge the tomatoes for 30 seconds in a pot of hot boiling water, then move them with a slotted spoon into a bowl of cold water. This will help you skin the tomatoes. Once peeled, collect the tomatoes in a bowl and squash them with your hands. Cover the bottom of a pot with extra virgin olive oil, add the finely chopped garlic and dried chili pepper, according to your taste. Cook te garlic on low flame until fragrant and golden, then add the peeled tomatoes. Cook the tomatoes on low heat for about twenty minutes, until they start to collapse into a sauce. In the meantime, dip the slices of stale bread in cold water. When they have soaked up enough water to become soft again, squeeze them in between your hands to remove all the excess water and crumble them into the tomato sauce. Add a cup of hot water. Season with salt and cook on low flame for about ten minutes, stirring vigorously from time to time with a whisk to give the pappa al pomodoro its typical creamy texture. Turn off the heat, add the torn basil leaves and pour over the soup the rest of the olive oil. Set aside for at least an hour, allowing the flavors to mingle, then serve warm or at room temperature. It is again that moment of the year when my dreams of glory make me hope that it may be the right time to be selected by Saveur for their Saveur Blog Awards, the most prestigious international awards for food writers and food bloggers. I’ll be grateful as always if you would nominate Juls’ Kitchen among your favourite food blogs for 2017. I’ve been thinking a lot about which category I feel I belong to, as you should point one, and I think Most inspired weeknight dinners might best reflect the spirit of this blog: homey, daily and reliable recipes which make a difference and give an authentic Italian twist to your weeknight meals. This salad, the stuffed eggplants or the minestrone, aren’t they the proof of it? So if you want to cast your vote, follow this link. On the 20th of September Tommaso and I will be in Rome at Latteria Studio, a place I’ve been dreaming to visit for ages, for a cooking class completely dedicated to La Cucina dei Mercati in Toscana, our last cookbook which explores the best Tuscan food markets and their most typical recipes. We chose a menu which perfectly represents the area we are from, with recipes from Chianti, Val d’Orcia and Siena. We will cook a quick and versatile appetizer made of stale bread and pecorino, with an unexpected ingredient, white wine. We will hand roll pici, thick home-made spaghetti from the Val d’Orcia, and dress them with a rich sausage sauce. We will cook vegetables as the Italian do, until they surrender in a delicious green bean stew. Latte alla portoghese, with a hint of saffron, will close the meal with a sweet ending. Wines from a local farm will accompany our meal and our chats over a table of shared honest food. This is a hands on all day class with a maximum of 8 participants. If you want to book your spot send me an email to info[@]julskitchen.com. I’ve been dreaming about Pappa al Pomodoro this summer now that our tomatoes are coming in fast and furious in our garden. Your recipe looks great, I hope to try it this week! I’ve just ordered your book and it should arrive in the next day or so. Congratulations, it looks lovely. Curious about freezing this soup? Is it possible? -Thanks! I actually never tried freezing it, but I guess it would work! Great! Since we have a bunch of tomatoes coming in right now and extra bread this gives me something to do with both. Thank you! great idea! You’ll love it!